The work of the Virgin River on the Navajo Sandstone in the Zion National Park is breathtaking! We were awestruck by the geology and beauty of the park. I can see why the US government wanted to preserve the canyon from development and make it accessible to all. We spent the day yesterday in the park, arriving before sunrise and leaving exhausted at 4:00 PM. Our first hike was through The Narrows, an aptly named gorge at the end of the road leading through the canyon in the southern part of the 500 kilometer square park (larger than Guam). On a planet dominated by the impact of humans, walking through the river confined by the massive rock walls of the gorge, made me feel tiny and insignificant. The enormity of geological time it took for the river to carve through that much solid rock! Humankind has been here for such a short time and those rocks will probably be here long after humanity is gone. I know this is all a cliche, but when one is looking up a 200 meters+ sheer rock wall while standing in a gently flowing creek, it is the only thing that comes to mind. The air was cool because the sun does not reach the bottom of the gorge very often. The cold water and green lushness were in stark contrast to the rest of southern Utah. Temperatures have been over 100 F all week with a relentless desert sun forcing us indoors in the afternoon. It was good to arrive on the first shuttle bus to trail so we had the river to ourselves in the morning. We walked the mile trail to where you can enter the water. The river depth ranged from ankles to mid-thigh and was easily fjorded. We walked 3 miles downriver to the Orderville side canyon, ate brunch and headed back out. On the way back, we ran into hordes of walkers. I highly recommend an early arrival! In the afternoon we hiked the trail leading to observation point. We wanted to see some the canyon from a different perspective after being in the bottom of it for the morning. As you can see in the video, the views did not disappoint. We were a bit concerned for the kids, as the trail dropped off precipitously as we ascended quickly. The hot sun and steep incline caused the kids to whine a bit, but we made it to our goal of a shaded canyon area on the rim. This was my favorite part of the day. The contrast of the red/white rocks and green vegetation and blue skies was heavenly. 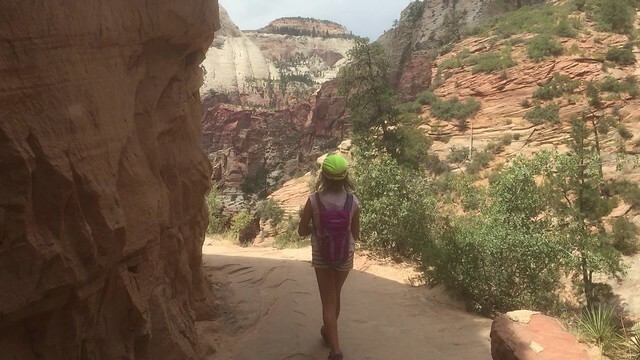 The majestic canyon walls as a backdrop, made walking up the trail easier. It was one of the most beautiful places I have ever been to! After a rest day today, we will head back tomorrow to complete the hike to the top! In reading about the park before the trip, we were worried about the crowds and the dangers of the park. Because we arrived at sunrise, there was absolutely no traffic and elevation rise of the strenuous trails takes the vast majority of visitors away. We met a few hikers, but mostly had the place to ourselves. Our children, ranging in age from 8-13 did fine on both hikes. They are experienced hikers and can handle a variety of terrains. I hope I’ve instilled in them a love of wilderness and being active outdoors.